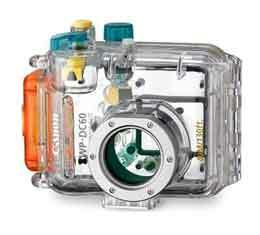 The Waterproof Case WP-DC60 with large easy to use controls and a secure grip designed for Canon Powershot A510 and Powershot A520 digital cameras can be used at depths up to 130 feet. The combination of the A510/A520 digital camera with the WP-DC60 housing is great for family vacations at the beach, while skiing, or simply to protect the camera from the elements. On a rainy day, the Canon WP-DC60 Waterproof Case makes shooting easy and fog-free.